Newly planted plants need serious watering to get their young roots going. These days, self-watering plants are all the rage. And they’re really convenient because they intelligently irrigate your crops when and as needed; preserving water and giving you the freedom to continue with your daily chores without worrying about stunted growth or plants dying as a result of thirst. You, however, need to be careful because of the potential problems with self watering pots including becoming breeding grounds for mosquitoes and causing root disease. A self-watering container has 2 pots: an outer pot which usually holds the water and a second inner pot which usually holds the potting mix. 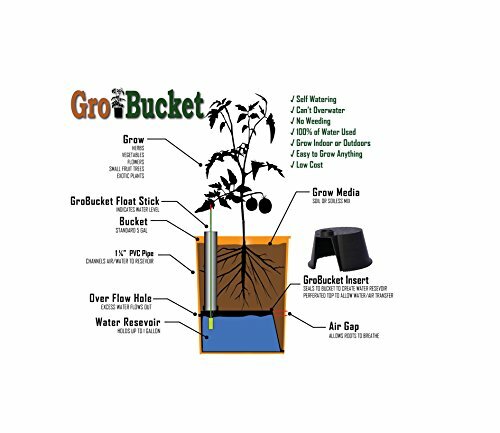 The wick joining the two compartments allows your plant’s roots to sip water from the reservoir as and when needed. Most of the contemporary water planters have a separate water reservoir. The soil draws up water from the outer container (through the wick)- provided the reservoir is full- using the capillary system. Flooding is rarely a problem with one or more holes helping drain excess water from the crop’s soil. This excess water subsequently collects underneath in the reservoir. Other planters come with an overflow hose which ensures that the platform is never swamped. The container and the potting mix cannot be left to dry out completely as the wick will be unable to draw water causing the roots to wither and die. For a detailed step by step article on how to make a self watering planter click here. A major challenge with self-watering planters is the higher concentration of various mineral salts in the planting mix. This mainly occurs because water is continuously being drawn up the pot from beneath and evaporated via the top which in the end leaves dissolved minerals behind. These mineral salts build up can eventuallybe harmfulto your plants. Drainage holes are essential in self-watering pots. Unfortunately, they offer a perfect breeding nest for mosquitoes. Pesky mosquitoes will lay their eggs there and when they hatch, mosquitoes will multiply because of the perpetually soggy conditions. Some self-watering planters don’t have an overflow opening. The water can, therefore, flood the platform and deeply wet the soil. Eventually, your plant roots will start to rot leading to stagnated growth or plant death. Another possible outcome is the growth of fungi which will again interfere with the healthy growth of your crops. Someplants –including succulents and cacti -need to thoroughly dry out in between watering sessions and will suffer if you make a mistake of cultivating them in these planters. Certain herbs, for example, the rosemary are said to lose their strong taste if grown in damp soil. On the same note, some flowers such as nasturtiums excel in more balanced environments and fail if putin self-watering containers where the soil is always damp. Naturally, plants like spreading out their roots and will push them in all directions- including towards the ground. Now, self-watering planters have water sitting in underneath the pot so when roots branch that way, they land in pure water. But they won’t grow there because of insufficient oxygen. This reduces your plant’s root mass inhibiting healthy growth. To prevent mosquitoes from breeding from your planter, flush its water after every few days. You can also plug the planter’s holesusing a pot scrubber to prevent the insects from flying in while still letting water to flow out. Your plant’s leaves (tips) will turn brown and dry if harmful salty buildup occurs. Removing the water reservoir and flushing the soil with tons of fresh water may help. You can also be going for a fresh potting mix each planting season. Also, avoid using liquid fertilizers, time-release fertilizers or water with high salt content for these planters. If anything, compost is the most recommended fertilizer for crops in self-watering containers. To avoid the frustrations of planting the wrong plants in your self-watering pots, do your research. Obviously, you’ve to go for a self-watering planter with an overflow opening. You can also drill one. Using a more porous/airy soil also minimizes root rot. If you have a large planter, try to reduce evaporation by covering the soil top with mulch. Planting using moisture-retentive soil mixes help to decrease the frequency of refilling. Also, soil for growing in self-watering containers should be light, friable, and well-drained to encourage excellent growth. Never leave self-watering containers out after a heavy frost. Otherwise, the water pot in the base may freeze and expand making the chamber to break. And if you must store them outside during winter, ensure you first drain the base completely dry. The best size of self-watering pots to use depends on the plant(s) you are planning to grow. Generally, you should pick the biggest container available since it will hold more soil which means a bigger root growing space and improved root growth. You can reduce moisture loss (from leaves) by using an umbrella to protect plants from punishing midday heat. Flowers, vegetables,and herbs have unique nutritional requirements, so use the recommended dry granular fertilizer for the type of crop you are growing. Also,use it as per the package directions. There is a wide variety of self watering pots in the market, as a matter of fact you are spoilt for choice, so choose wisely. Yes, self-watering planters drastically cut the amount of time you spend watering your crops and sets you free to pursue your other chores. However you could face potential problems with self watering pots such as poor root growth, toxic minerals buildup, and fungi. Some helpful remedies include using porous soil, flushing your potting mix with lots of water,and plugging the planter’s drainage holes with a pot scrubber. Others include thoroughly researching your plants and going for a planter with an overflow.